A group of South Korean medial scientists has developed a new type of non-surgical procedure to deliver drugs to tumors in the brain, the science ministry said Tuesday, opening up new treatment opportunities for patients. Drug delivery to brain tumors has been considered challenging because of the presence of the blood-brain barrier that is in place to protect the critical human organ from non-natural substances. 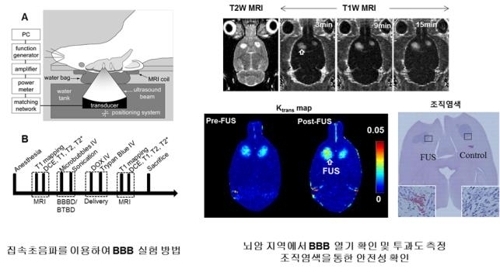 The team, led by Park Joo-yeong of the Daegu-Gyeongbuk Medical Innovation Foundation, developed the new method to inject a drug called "doxorubicin" by opening the blood-brain barrier, the Ministry of Science, ICT and Future Planning said. "In this study, dynamic contrast-enhanced Magnetic Resonance Imaging (DCE-MRI) was used to characterize focused ultrasound-induced permeability changes in a rat glioma model and in the normal brain and to investigate the relationship between these changes and the resulting concentration of the chemotherapy agent doxorubicin," the researchers said in a paper. "This is a new technology to increase the effectiveness of the treatment by opening the blood-brain barrier, as many drugs in the market have not been able to pass through the barrier so far," said Park.